Automotive Wheels Market size is estimated to exceed USD 100 billion by 2024; according to a new research report by Global Market Insights, Inc.
Increasing vehicle sales coupled with shifting consumer preference toward comfort and improved driving experience will enhance the industry demand. Growing popularity of corrosion resistant, light-weight, and high strength parts are prominent product attributes that will fuel the automotive wheels market growth through the forecast period. Increasing passenger cars sales owing to growing disposable income and mobility requirements will significantly contribute to the automotive wheels market share. In 2018, European Automobile Manufacturers' Association (ACEA) witnessed around 12 million passenger car vehicle registrations with 2.5% growth rate from January-September 2018. Requirement to cater the growing vehicle demands coupled with the requirement to provide competitive products will fuel the market growth. Increasing vehicle ownership with the growing purchasing power of consumers has led to a significant increase in the automotive wheels market demand. Aluminum wheels have gained significant popularity over the past few years predominantly due to its low density and high strength. Availability of these wheels for utilization in compact and economical vehicle models will continue to provide strong growth prospects over the forecast period. Compliance with stringent European Union compliances to curb CO2 emissions have necessitated automotive OEMs to integrate lightweight aluminum and magnesium alloy wheels. Similar regulatory norms in the U.S., Japan and Australia will influence the fuel emission regulations in other emerging economies, in turn generating demands for light weight material alternatives. Moreover, advent of carbon fibers and alloy materials will provide potential growth opportunities for automotive wheels market size. Manufacturing methods of automotive wheels are more complex owing to the casting, forging, and forming processes. High initial raw material and machinery acquisition cost will continue to hamper the overall automotive wheels market growth. Additionally, in June 2017, European Commission announced an extension of anti-dumping duties on aluminum wheels imported from China. Introduction of tariffs and duties will continue to hamper the industry growth through the forecast period. Industry participants are investing in R&D to introduce innovative solutions that prevent damage of wheel assembly from potholes. For instance, in 2017, Michelin and Maxion Wheels developed MICHELIN ACORUS technology. This patented technology had two rubber expanders that extend when the vehicle suffers from an impact. Advent of innovative technology solutions that can improve the consumer riding experience and comfort will catapult the industry growth. Rising prominence of aluminum automotive wheels is witnessed owing to its contribution to weight savings, styling flexibility and enhanced mechanical properties. Reduction of unsprung mass, improved car handling and riding comfort will provide strong market growth opportunities. Moreover, its high thermal conductivity allows faster heat dissipation and improves braking performance eventually enhancing the driving conditions. High-performance automotive wheels market segment is expected to witness significant growth. It offers high-impact force resistance, extended durability and enhanced wheel performance. Presence of numerous wheel manufacturers offering customized and uniquely styled forged/cast wheels are expected to provide positive outlook for the segment growth. Based on end-use, OEM automotive wheel market segment is expected to continue its dominance through the forecast period. Long durability, robust performance in all weather conditions, and low replacement rates are expected to remain the prominent factors contributing to the industry growth. Industry participants are expected to emphasize on establishing supply contracts and agreements for long term product supply to strengthen their industry foothold. Asia Pacific automotive wheels market segment will continue its dominance over the forecast period. 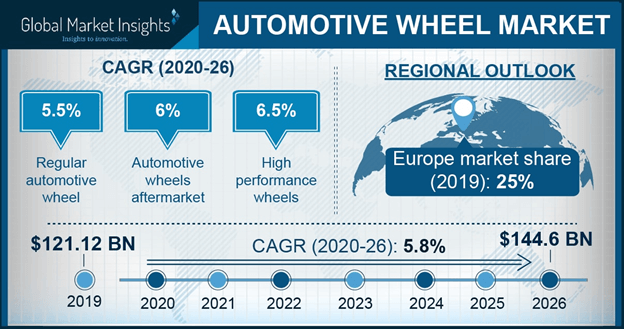 Strong demand for aluminum wheels in the passenger cars coupled with the aftermarket customization requirement will continue to favor the industry growth through the forecast period. Some of the leading players in the automotive wheel market include Maxion Wheels, Changchun Faway Automobile Components Co., Ltd., Ronal Group, Zhejiang Wanfeng Auto Wheel, Titan International, Inc., Topy Industries Limited, Borbet GmbH, and Superior Industries International, Inc.
Industry participants are focusing on product innovation and merger & acquisition initiatives to strengthen their industry foothold. Product innovations include the development of lightweight aluminum & magnesium alloys and carbon structures that feature lightweight and improved tensile strength. For instance, in in 2018, Dymag introduced BOXSTROM 7Y, a carbon hybrid automotive wheel. This enabled the company to strengthen its foothold in the in the carbon fiber material technology space.